Almost two years ago, Red Thread Boston moved in to a new workspace at 101 Seaport Boulevard. This space was a third of the size of our old office, but it has allowed us to reduce and optimize our footprint and modernize our strategy to incorporate a more distributed work model. Our workplace transformation helped us identify who we are as an organization and what we value. Today walking through our office, you can see that it functions as a working showroom: We use our space in a way that meets the needs of each individual employee and our company as a whole. A creative workplace culture provides employees with the tools for success. 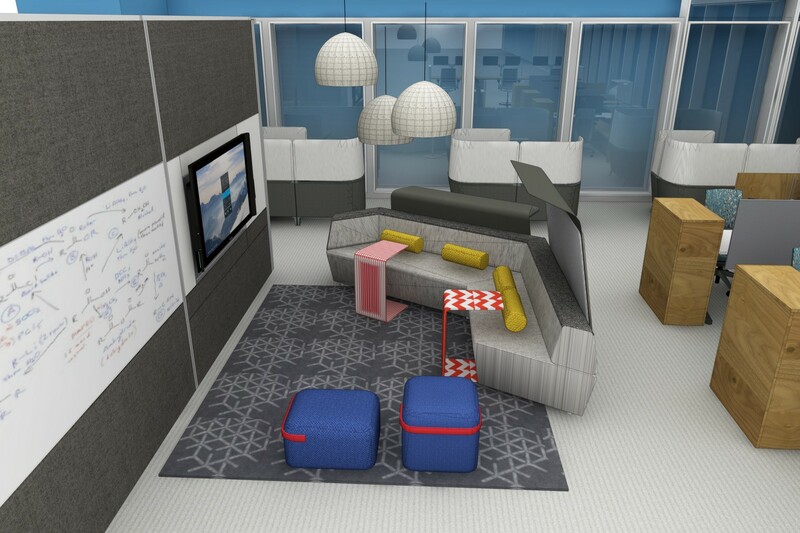 By adding features like the Campfire Paper Table and Marker Board Walls, we provided tools to capture ideas in an informal impromptu collaboration. Along with new analog support for creativity, we integrated more digital options. Our new “Creative Studio” features a Microsoft Surface Hub, perfect for team collaboration, and in our enclosed oasis we added the Meeting Owl to introduce intelligent 360° video conferencing. In addition to focusing on how to facilitate creative group collaboration, we wanted to evoke more individual creativity. Inspiring colors, textures, and patterns are integrated within the design throughout the space, from the wall coverings to the throw pillows. New ancillary furniture offers a wider variety of choice regarding where and how people work: Settings support a mixture of styles including team collaboration, solitude for deep thinking, and side-by-side work. The autonomy to choose from this array of inspiring work spaces encourage creative thinking and helps boost engagement. When providing a variety of work settings for people to choose from, it’s important to take in to consideration that different tasks require different levels of privacy. Previously, our space had both open and closed settings for individual work and team meetings. However, we were missing spaces that were shielded, visually and spatially separate but not isolated behind closed doors. To create individual shielded workspaces, High Density Cabinets were added on the side of Ology workstations: When the cabinets are pulled out, they function as both storage for personal belongings and a visual and spatial barrier. Using Post and Beam, Steelcase’s architectural framework, we create shielded meeting spaces that also serve as a separation between work zones. Felt strips hang from the Beam, adding visual interest and privacy. Post and Beam create a space to accommodate small meetings of 2-4 people for our salespeople and coordinators, located on the adjacent work zones. To better facilitate communication with the two groups we co-located the teams and added easily accessible meeting areas. The results are tangible, as you experience the high energy and buzz of the teams working together. Since a majority of our office is free address and people move around throughout the day, most of the spaces were designed to support short durations of work. 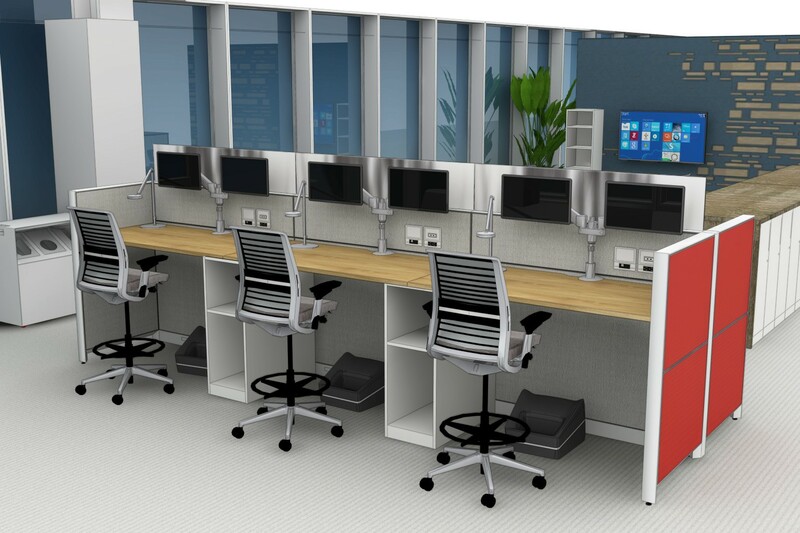 However, after a few years at 101 Seaport, we realized that we needed more spaces where people could comfortably perform heads down work for longer periods of time. 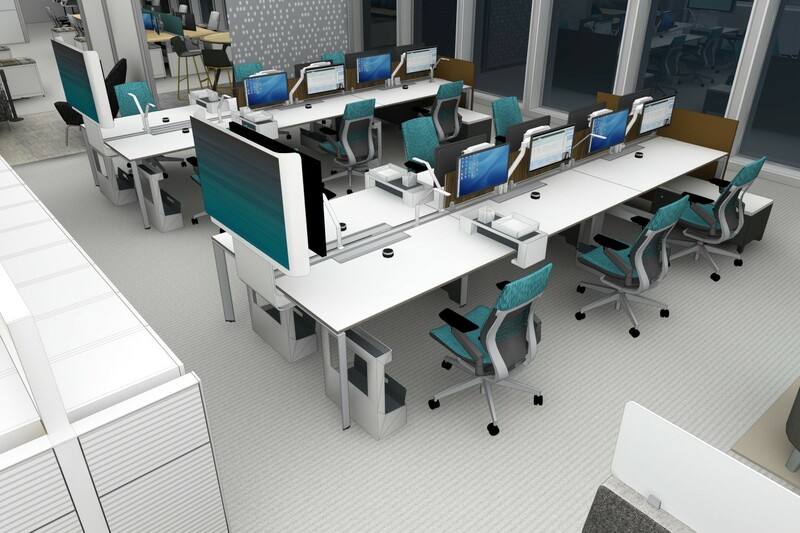 The result was a nod to traditional workstations, featuring lower panels and undesignated seating. We also added in permanent monitors for people to display content from their own devices, both dual and signal screen stations support design work and those who just prefer a larger display. Through this refresh, we have improved the functionality and productivity of our space. 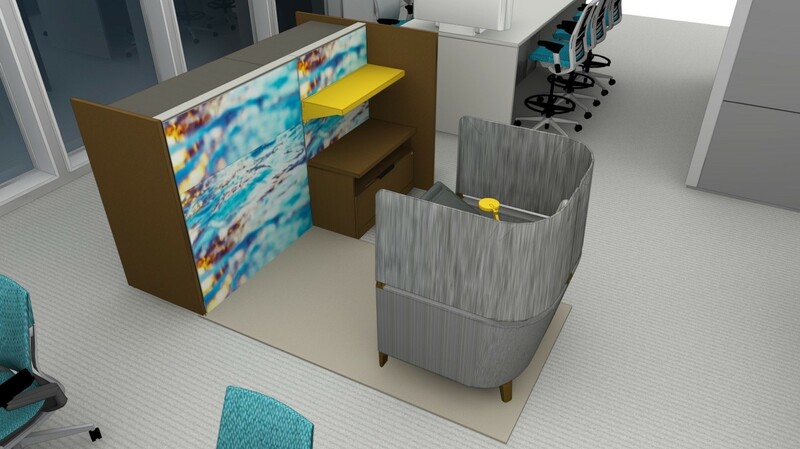 New work settings have co-located teams, provided more options for collaboration, and created private spaces for solo and long duration work. The new technology, ancillary product, and finishes incite and support creativity. Overall, we transformed our space to provide a more comfortable and residential experience that will improve the way our people work.